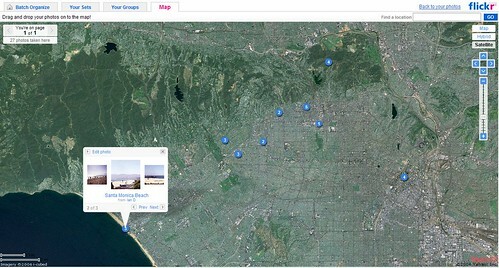 Flickr finally supports geotagging from within it’s toolset without the user having to add on their own geotagging apps. It’s really easy to use – search the map, search for your photo’s and then drag the photo to the point you want to map to. Done. At the weekend I had added in some photo’s from my trip to America in 1995 and as I had heard Flickr may add the new functionality I had geotagged them. But wait. Thats was done using Google and an add-on to Flock. Would the tags work with Flickr? The answer is yes – Flickr have provided an importing tool so that photo’s already tagged can be imported. Worked with all my photo’s and gives me an excellent new way of viewing my albums. The only downside is that at the moment there are no high resolution pictures or maps of Glasgow. Doh. Searching for an address still returns an accurate point on the map but the lack of a decent street map or photo takes away the immediacy of adding pictures or where exactly the picture was taken. Still – theres a few added to Glasgow already. 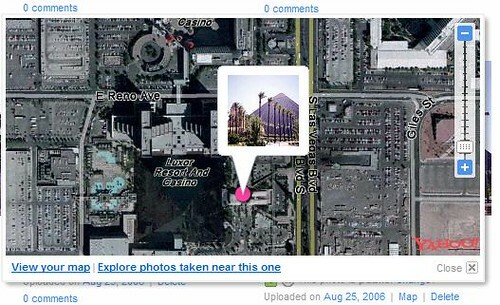 Even easier – if a photo has been mapped then a map link will appear next to the photo or in the information panel at the bottom right of each photo. Also the ugly lat and lon tags are no longer required. Instead you will get a real world destination i.e. Taken in Las Vegas, Nevada. For those photo’s imported the tags will be automatically removed at a later date. The best online photo management and sharing application in the world just got a little bit better and this new feature makes it easy to find great photo’s of an area without having to tag it. I’ve tried Zooomr out a couple of times but Flickr still wins due to size of community, other application support and features. However Zooomr today added Portals which is a nice way of adding details to photo’s and linking through to other photo’s in a set – almost like picture within picture on a TV. Good examples can be seen in the video on Zooomr Blog. Another year, another phone. This is the 3G follow up to the k750i, my current phone. Although it’s been out for a couple of months I wanted to get the phone on T-Mobile’s Web ‘n’ Walk deal and take advantage of all that 3G speed online. So after a few days how has it faired? In the box you get the phone plus USB cables and also headphones that double as an aerial for the radio. 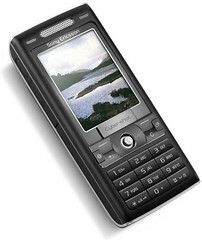 The k800i uses a new memory stick format, the M2. This really grinds with me – just how many different formats do manufacturers think we need? Also it means my previous cards wouldn’t work with the phone – more expense. However the T-Mobile deal included a 256Meg card which is more than adequate. The phone itself is heavier, taller and slightly more bulky than the k750i although it’s a great size for a 3G phone and the build quality is excellent. The back of the phone is rubberized and the only issue I have is with the lens cover – I’m sure that will break off over time. The back of the phone is also difficult to open which I guess is good in the long term – wouldn’t want it to easily slip off. The screen is excellent – more readable than the k750i, photo’s and in particular small text is clear and sharp. 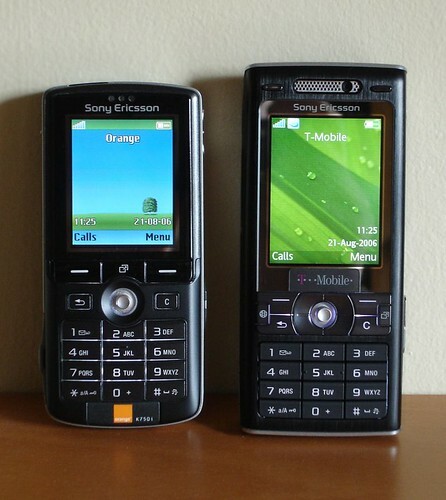 The software built into the phone is almost identical to the k750i except additions for RSS and Video calling. Voice quality has been excellent and on a par with the k750i which was one of the best phones I had used. Signal strength has also been excellent over the last few days. The software on the phone also supports apps working in the background. You can be on a call or listening to music and at same time surf or get/receive e-mail. You can swap to apps running in the background via one of the keys on the front of the phone – very swish. I was disappointed though with the software for synchronizing with Outlook. It is buggy and will only sometimes detect that the phone is connected. When this happens the launcher for file transfers also doesn’t work. Although it’s easy to connect in file mode so that transfers from the memory card can be made I recommend you download MyPhoneExplorer which has worked 100% for me. You can transfer files, sync calendars and get some other info like firmware version, battery life and temperatures. Another disappointment’s is lack of Mac support from Sony. Less than a day after launch Flickr and Tagging plugins are available here. Think how extensions make Firefox and you can see where Live Writer may end up. Microsoft have just launched a new blog editing tool, Windows Live Writer. This is a desktop based tool that allows anyone to post to their blog using a rich GUI driven environment that offers spell checking and easy insertion of pictures and maps. Once downloaded you insert your user details and Live Writer will then connect to your blog and download categories, check blog type and ensure a connection can be made. You then choose a title and start blogging. Inserting links and pictures was very easy but the key test will be the markup that is applied to the post on the real site. One nice feature is that drafts can be saved to your website (unlike Flock) so that editing can take place at a later stage. Web Preview is also useful as it allows you to see how you post will look once it is uploaded to your site. The tool has full undo and redo and while it is GUI driven there are only options for common tasks like font weight, bulleted and numbered lists, blockquotes, hyperlinks and images. Multiple categories can be selected as well as options to turn off comments and trackbacks. Spell checking isn’t live and has to be run at the end of you post. This post was written in Live Writer so the real test will be how this looks on the site. Will it handle the publication of images and also the formatting? If so then this is an OK tool for some quick blogging but no different to whats available in Flock or Performancing. I’m sure it will appeal to some users especially as there is an SDK allowing plugins to be developed for the platform but for me I’ll stick to using the WordPress GUI as I feel more in control, know it works and can apply tags and other features with ease that aren’t supported in Live Writer. *Update* – posted with no problems. Markup looks a bit ‘iffy’ but images got to the site once I’d setup FTP properly. More difficult to edit as the text is one big blurb rather than a nicely spaced out draft post but I can see this tool becoming quite popular. Ah – just spotted categories didn’t come through properly. Still – it’s only a beta.